These books are perfect entry level designs for beginners to cut their teeth on. Simple patterns with minimal pieces. 22 patterns including florals, butterflies, squirrel, golfer, bass, seagull, American flag, proud eagle, rose, a "Lest We Forget" ribbon, and more. All contain 25 pieces or less. 36 pages, 4 in full color. Included are 34 full size stained glass designs, each containing 30 or less pieces. Subjects include penguins, butterflies, leaves, cyclist, poodle, lantern, space shuttle, rainbow, lava lamp, shells, flowers, dragonfly, sandpiper, and others. All designs are shown in full color. 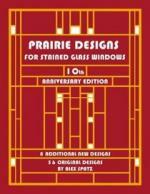 Features 48 designs created by the Prairie School of Design. Prairie-style patterns convey simplicity, unity and nature, making these straight-cut projects ideal for all skill levels. Create designs with the elegance and simplicity of Frank Lloyd Wright. These 9x12 books with perforated pages are a must have for everyone's library! They are not your typical pattern book, but rather each book has 12 complete pattern books inside, with 300-400+ full size patterns. 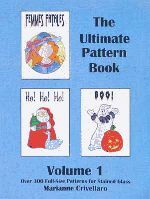 The patterns are ready-to-use from beginner to intermediate skill levels, and suited for any occasion, theme or holiday. Simple patterns that are far from boring; ideal for stained glass panels, suncatchers, mosaics or fusing! This is an inexpensive and convenient way to stock up on fun-to-make projects.